The Mac version is a work in progress. When we started Obduction three years ago, Unreal Engine 4 included limited Mac support. While we’ve been building Obduction, Epic has been improving the Mac version of Unreal, but it is still a little raw. As a result, it would be best to think of the Mac version of Obduction as an early release. Rest assured we’ll continue working with Epic and provide updates after launch. And just FYI, if you want a better launch-day Mac experience, Obduction works great under Boot Camp. Sounds like Epic has been dragging their feet with the Mac version. And I'm sure OS X isn't helping Strangely I am not as sad as I thought I'd be as I'll be rebooting for Deus Ex Mankind Divided anyway. And I'll be getting the best possible performance in Windows, sadly. I was a Kickstarter backer and just got my final shipment receipt last night. Can't wait to play it! Cyan's games were the best back in the day. Just got my notification in my email about my Kickstarter receipt as well. They made it sound like the Mac version will release at the same time, but the performance may be hit or miss (consider it a beta basically). Looking forward to the reviews. Maybe I should also finally get around to completing Myst. As one of the Mac programmers at Epic I take exception to that - we've been slaving away on the Mac support in UE4 for years. Mac OpenGL certainly didn't help us much as it doesn't (and won't ever have) the features or performance we need so the switch to Metal was really important. Unfortunately its quite a big job to integrate and debug a new graphics API in UE4 and its taken a year or so to get the Metal integration to a reliable state - the upcoming UE4 4.13 release moves things on quite a bit but obviously Cyan couldn't use that. There's no foot dragging here - just the reality that work takes time to complete. Seems like between the lagging Mac hardware and the switch to Metal, Epic is really fighting against the tide here. And we've seen some discouraging signs from other developers too (e.g. Blizzard, Feral). Thanks for the reminder that we shouldn't take the effort for granted. I think it's easy to look at the developers because on the PC and console side that's usually where blame lies. Unfortunately as Mac gamers, we have the unique issue of our hosts (Apple) bring all their stuff up to spec for gaming on Mac only under the light of the full moon on Durin's Day. And I think even that got cancelled when Steve Jobs passed. Well, World of Warcraft just released it's Metal implementation in the pre-patch for the upcoming Legion expansion. I should make a post about that elsewhere. It was interesting to run something on my iMac using it finally. The only initial impression I have to share is WoW runs well and looks good with some enhancements added but those also exist in the new DirectX 11 for Windows release and I'm not sure to what extent on the legacy OpenGL release for Macs which I didn't bother looking at. They basically gave the game some graphics touch ups across the board so trying to come up with comparisons would be pretty tough really. Draw distances are increased and a lot of new graphics options are incorporated that enhance spell effects significantly for one thing. It did look cool when I ran around in Felwood on my hunter killing stuff for a bit. So a good first Metal API game from Blizzard there. Did you actually notice FPS increase? I don't play WoW but I'm looking forward to Metal support for Starcraft 2. Well as I mentioned any comparisons would be tough, pretty impossible really in simple FPS terms because so much changed along with the Metal implementation as well as the DirectX implementation of the game. So there isn't really a valid baseline to compare to. My sense without even playing around in the game much yet is that Metal probably has facilitated the implementation of more features while mitigating a performance hit for it as opposed to doing both that and increasing performance at the same time. In other words, my sense is that Metal in this instance brings quality improvements at roughly the same performance level which is still a nice win. Please keep in mind though that is just my very unscientific view after a little informal testing out of the new release and a review of the many changes to the graphics options now available in the game. People knock WoW for it's cartoon graphics and while certain aspects of the game do betray its age by and large I think it looks very good. The art direction is great. The world is colorful and interesting to explore. The NPCs are cool looking. The character models have been upgraded without drastic changes that players would not have wanted, myself included. A lot of graphical bells and whistles have been implemented to make the cartoons look better if you will. In particular I noticed improvements to spell effects right away the first time I killed something. One could argue that WoW is not exactly a showcase for Metal from a visuals perspective and relative to another game going for a realistic looking world I'd have to agree (if we had one yet) but I'm of the opinion that a cartoon game is just fine. It's great in fact. I have a lot of fun there but I also use my head and don't do stupid grinds for virtual stuff that will reset next expansion if I don't feel like it. And when I tire of it, I take a break. So I don't burn out and come to hate it. This works for me not just with WoW but the other MMOs I bounce between. Sorry, wandered way off on you there. Short version: I don't know how we could assess any performance change in a game that just got so many graphical upgrades other than to say I am happy to have them without a detrimental change in performance. The game runs smoothly and looks good here. I am happy with it. I am going to compare it to the DirectX 11 version I have installed in Windows 10 just informally to see what is different if anything much. I'll write a post on that somewhere when I get to it which will be soon. Oh, and I will try to get some sort of FPS comparison but that'll need to be taken with a fair grain of salt all things considered I suspect. I will try to recreate a similar situation in both releases though and with close to same if not same settings and see what if any FPS differences there are doing that. It seems like the question you'd want to try to ask with your comparisons is, does Metal narrow the gap between Windows 10 and Mac performance, while at the same time including more graphical bells and whistles? Well, as I said I am just taking a cursory look and good enough. To be honest I don't really care about it that much anymore personally. In fact i worded my last reply poorly when I look at it because I should have said I am happy the changes don't cause a drop in performance from what I saw vs. I am happy to have them which isn't exactly correct. I won't be playing the Metal version. I'll be playing the DirectX 11 version. Aside of a few titles I only own for Mac that i haven't played yet, I'll be gaming in Windows from now on where desktop gaming is concerned. I am curious about Metal and already had WoW installed so figured I'd check it out but I am not going to make a project of it. If you want to see for yourself in more detail though, you could download the trial edition and check it out in both OpenGL and Metal as this can be toggled in the graphics options and do some testing. I don't know if you happen to have Windows installed to check that as well. I don't want to bash Apple or gaming on Macs or anything like that but between the hardware, the cost, the restricted selection which affects me at times, etc. going with a gaming rig just makes a lot more sense for me next system coming up. I wish Apple would make a machine for people like myself so I could do it all with one desktop but sadly they don't. According to Blizzard, it's getting there. Obviously, it will have more features (since OpenGL is EoL), and they say they're seeing about a 15% (best-case) deficit (compared to DX11) in their tests (of course, they're working with 10.12 and unreleased code). They continue to work with Apple and the driver developers to improve (and now that WoW is out, HotS should be next). Is it? Haven't they just also implemented a new Core OpenGL (i.e. 3.3+) rendering engine? A comparison between that one and the Metal engine would be interesting, both feature and performance wise. In OS X El Capitan I am using the standard Apple supplied graphics driver, not the Nvidia web driver. 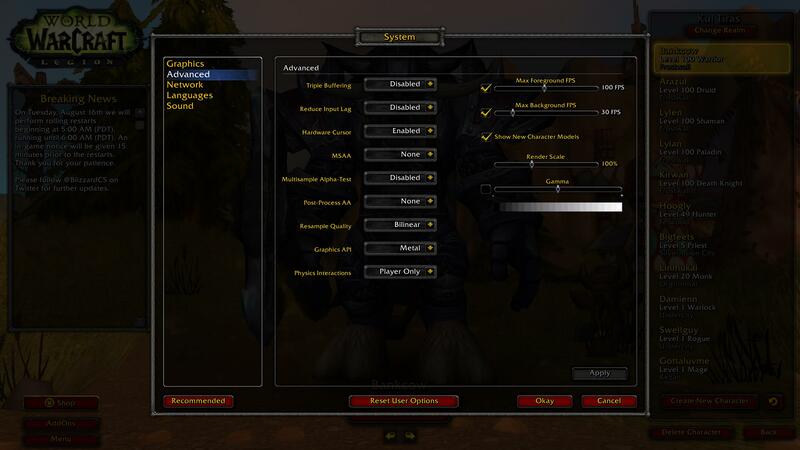 What I found for openers is the same graphics settings options do exist across the board in both Metal and DirectX 11 versions of WoW. Interestingly in both cases, the toggle for either Metal or OpenGL was set to Custom which is not a choice when you drop the menu to look at what is there. Once you do that, you then need to choose one or the other. So, I have no idea what custom represents and it is not user selectable other than when you make sweeping changes with the graphics slider that goes from 1 to 10. When you change that slider I noticed at the top level of graphics options (there is the first large dialog box and then an advanced dialog with more) it moves the draw distance and two other values paired with it in tandem, so an overall setting of 5 means a draw distance of 5, etc. This also resets the graphics API choice back to "custom" whatever that is. This same behavior is also seen in the DirectX 11 version where it begins as custom and if you change it, the choices are DirectX 9 or DirectX 11 and no custom choice displays but if you move the top level slider it returns to custom. Something interesting I noted was the default recommended settings for my system (there is a button to reset to these at any time) start out at a 7 on the Mac in OS X El Capitan and they start at a 6 in Windows 10. As noted above, the graphics API used is set to custom off the bat so I don't know what they are recommending there because of that label for this in either case. View Distance, Environment Detail and Ground Clutter sliders moving from 6 to 7 and SSAO moving from High to Ultra. Note: I did go back and explicitly set DirectX 11 after I moved the slider. I then exited and restarted the Windows version to do the same simple bit of testing I did on the Mac side. Before I get into that one other little change I noticed was in the case of the Mac version using Metal, when SSAO is set to Ultra as it is by default on this system, there is a bit of bright green color text next to the setting that reads: nVidia HBAO+ but this is not displayed when that is set to Ultra in the Windows version. So, with that stuff out of the way what I found running around my fully built up garrison, inside the main building and zoning out in the surrounding area and then running back, taking the same path each time and observing the game's built-in FPS counter that overall I was ranging between 50 to 60 FPS outdoors including in a busy area with a lot of npcs roaming around, a lot of various fires and smoke effects, etc. and turning here and there to change my view. I rode around on my Horde Chopper just because also. I then took the same path back to my starting point from a fairly good run around the area which including going back inside my main building where as usual the FPS is much higher. I hit around 90 in there in a large room packed with npcs, etc. When I did basically the same exercise as close as I could to what I'd done in the Metal version in the DirectX version on Windows 10 the FPS counter was reporting between 40 to 50 FPS overall. So, there you have it I guess. The Metal version in a very simple test here outperformed the DirectX 11 version on my iMac by about 10 FPS average overall using the same settings for both which ignored Blizzard's recommendation of going down one notch with them in Windows 10. Either way, to be honest if somebody sat me down at two of these same iMacs with one running Windows and one running macOS at the same settings and this difference I doubt I could tell which was what in the game. I also could not tell at all in terms of visual quality. If there are minor differences I would have to carefully examine two displays running the same image side by side. It looks nice here regardless of which version I am running and it runs smoothly regardless of which version I am running other than some server lag they are still trying to resolve which is typical whenever a major new patch or expansion comes along. What I take away from that just in terms of this one single game is that it seems to work very nicely with Metal and that's a good thing, particularly considering I am playing on a 2013 iMac. Hopefully this fall they'll roll out some new ones with current mobile GPUs that are so much better than what is in this. I think gaming on a Mac then would be pretty good if you spent for the top GPU option. All the same issues I have trouble with still apply though where I cannot imagine some dramatic change that permitted upgrades down the road. You know though, if I could afford a new 27" iMac every two or three years I might be okay with that because the two I've had have been so good really and they have been fine for gaming for me. I just don't have that kind of money that often so a computer I can upgrade is really important going forward. That's really the driving thing for me even over the performance because I'll still spend a lot initially on a good gaming PC. It's just that I'll get so much more mileage for the money out of one. I so wish Apple would get off this thing of making disposable electronics with too short lifespans. That is good for them and their shareholders no doubt but it is not very good for consumers in my opinion. By the way, my informal bit of cursory testing is just that. Obviously, I'd put a lot more stock in the numbers Blizzard gives for overall performance because they test this game in a far more methodical and in-depth way than I just did. They do have the new OpenGL renderer for WoW, but they've been pretty clear that it's mostly a legacy thing (for people who can't run the Metal renderer). It's also important to note that they were testing pre-release software (both macOS/drivers and their internal code). They also mentioned that the deficit is larger for Nvidia hardware (there's likely less incentive for Nvidia to work on Metal drivers since the Apple line-up is all AMD now, but Nvidia's DX11 optimizations are also much better than AMD and Intel). That's interesting in that I have an Nvidia GPU and I did observe better performance with Metal at same settings in El Capitan than I did with DX 11 in Windows 10. I don't know if you read the entirety of my spam but basically in an informal test running around an area with a lot going on as well as zoning to a large outdoor region and returning to the inside of a garrison building I was seeing about 40 to 50 FPS on average with DX 11 on this system and I was seeing about 50 to 60 with Metal. It is just one simple look but that is what i observed doing that. In both cases I never saw any severe drops of FPS so it runs pretty well either way here and my hardware is certainly nothing to write home about but then WoW isn't all that demanding even with its improvements. I probably should play around with it some more just to see what other changes do for it. In particular, dropping the resolution to 1080p. I know some people hate the idea of going below native display resolution but I've found for my eyes anyway that 1080p still looks decent. I do notice it very much below that but 1080p still seems good if not as good as native. It's a lot less pixels to draw so maybe I'd get a nice boost out of that. In any event, I am really looking forward to buying a gaming rig I hope in the first half of the coming year. It will be some kind of wonderful to play anything I want cranked up all the way. The settings are probably just different between platforms—there is no actual support for HBAO+ on OS X (AFAIK), for instance. So the Metal version may be turning in slightly better numbers, but it's also doing less. If that does not exist on OS X, why would it be highlighted in bright green next to the setting and not pointed out at all in the Windows version? My guess is Metal does enable that being the reason. It is either that or somebody at Blizzard incorrectly put that string in there, highlight color and all which I suppose is possible but does not seem very likely to me. The settings are the same. At least insofar as all of the available user defined settings go. I made sure of that when comparing them. Maybe you are referring to other features of the respective APIs that are not seen or configurable in user settings being different? That would make some sense to me but I admittedly know little about this stuff. 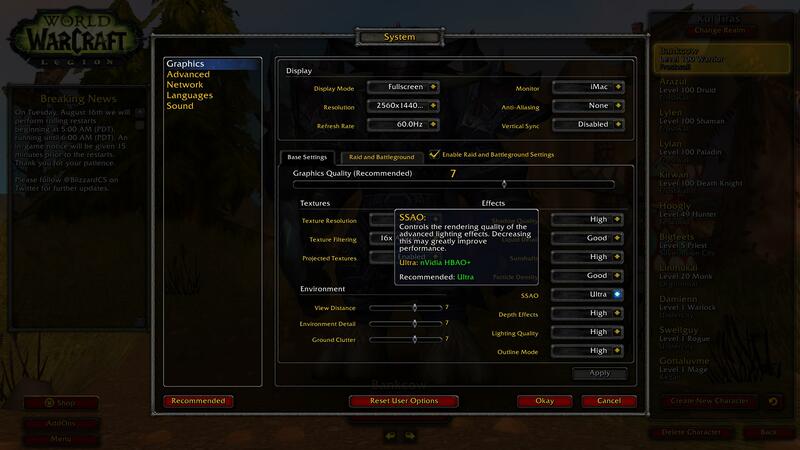 These are the settings used in both Metal and DirectX 11 for WoW on my system, except that bit of green highlighted text about the Nvidia SSAO feature is not present in the Windows version.